All toppers are made from non-toxic polymer clay and can be placed straight on your cake. If looked after your toppers will last a life time and will be a fantastic talking point. Remember your big day forever with your own personal keepsake. All my toppers are made completely to your description. You get to decide details like eye colour, hair style & colour, outfits and for a small additional charge extra items.Add your pets, children, vehicles or even your hobbies to make your toppers stand out and be a great novelty feature to your wedding day. The toppers are made from polymer clay which is baked to make them solid. If looked after these toppers will last a lifetime and be displayed proudly. 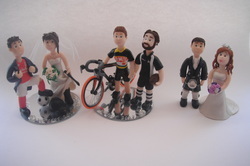 I am a professional artist specialising in portraits but a couple of years ago I found polymer clay when a friend ask me to make them a birthday topper. I had so much fun making it that when I was sadly medically retired from the Royal air force at only 26 I decided to make this a full time job.This is something I take great pride in and make every detail to a very high standard. I understand how expensive weddings can be and have tried my very best to keep my prices as low as possible. I love creating new things and the more challenging the topper the happier I am. I can offer discounts on large orders so please feel free to ask me any questions you might have.